I left a rag which I had been using to wipe off the lawn mower on the wood pile. I left it for a few days, you know how it rolls…… I’ll get that later, later…..
Well I did get to it later only to find that it was now occupied. Someone had moved in AND started a family! Yes this tiny spider was squatting on this rag. So now I have a dilemma… I need to move the rag, I’d like to wash this rag and I am totally taken with how territorial this little creature lets me know that She is busy here. She stands guard hovering right over her tiny white disk of a nest of her eggs like she is guarding it with her life. She has nestled deep inside one of the folds of the rag, she’s not moving. She adjusts her position when ever I peek into her home but stays right on top of her nest. I will find a quiet protected place to move her to, a place protected from the coming rain and wind. 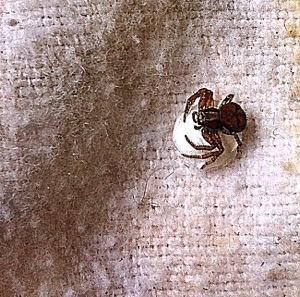 I’ll leave it just so so she and her new little spiders, when they hatch, can easily venture out into the world. The laundry can certainly wait for this little miracle. This entry was posted in blog and tagged mother, Spider by nancywalker. Bookmark the permalink.